These are Crispy Baked Popiah or Spring Rolls. The traditional recipe uses the wrapper that is made from wheat flour, and the rolls are deep-fried. However, I wanted to avoid the hassle of having to deep fry the rolls. 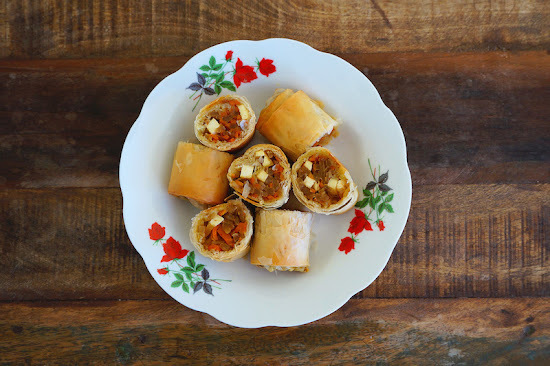 So, after experimenting with several types of wrappers for the perfect crisp, I opted for Filo pastry because they are easy to make, and results in an amazingly crispy and delicious spring roll. Prepare the bean curd: Pan-fry until golden brown, remove and drain on paper towel. When the bean curd is cool, cut into smaller strips. Set aside. For the Yam Bean Filling: In a large wok over medium heat, add peanut oil. When the oil is hot, cook shallots until golden in color. Then add dried shrimps, stir-fry until crispy, and toss in the yam bean and carrots. Stir and cook for about 8 to 10 minutes, or until the vegetables are soften. Season with sugar salt, and pepper. If the mixture is too dry, then add a little water (about 2 to 3 Tbsp). Once cook, let the vegetable filling cool completely. When you’re ready to roll the Popiah. preheat the oven to 375˚F and line a baking pan with parchment paper. Place 1 sheet filo pastry on a flat surface and brush with oil. Fold the pastry in half and place a heaped tablespoon of vegetable mixture along center of pastry and about 2 inches away from the edge, and form a small log between your hands. Then add some fried bean curd and top with another spoonful of the vegetable mixture. Fold the corner over filling and roll up tightly to enclose. Brush the end with oil. Press to seal. Place, seam-side down, on prepared baking tray. Repeat with remaining filo, and vegetable mixture and bean curd. Bake for 25 to 28 minutes or until light golden and crisp.